We've come a long way from the days of the diary and online live journals. Today everything we do is recorded with pictures and posted on Facebook, Instagram, Twitter etc., for all of our friends and family to see. We take pictures at school, work, sporting events, and even at restaurants to show others the food we eat. The paparazzi have doubled in size and pictures of anything and everything have consumed the internet. Keeping up with the times, you cannot post blurry and dark photos. What’s the point? With the ENHANCE Soft BoxFlash Diffuser, impress all your friends and give your pictures the professional level quality they deserve. I personally wouldn't use it for selfies but everything else you post online will definitely impress your friends. And for one week only, Accessory Genie is offering a $5 Savings and Free Shipping on all orders placed using the coupon code ‘DIFFUSE5’ at checkout. Starting April 14th and running through the 21st the ENHANCE Flash Diffuser can be yours for $9.99. What a deal! The ENHANCE Soft Box Flash Diffuser is equipped with dual mounting options for both pop-up flashes and external flash speedlites. It pops open and is ready for any action in seconds. The reflective-lined interior enhances your flash and spreads it out through the diffuser cloth, providing you with strong, even lighting in all of your photos. The even lighting helps to eliminate harsh reflections and fills shadows to bring maximum exposure to your pictures. The natural lighting effect is perfect for shooting professional-looking portraits, close ups, and more! 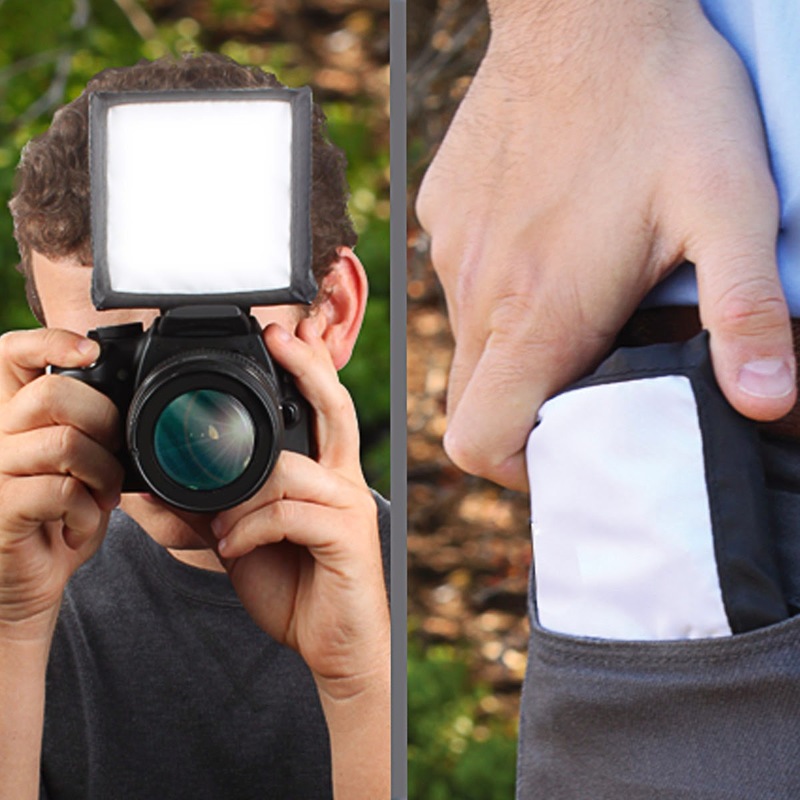 The flash diffuser is user-friendly, portable, and has two mounting methods. An internal reflective divider allows you to convert from external to pop-up flash mounting to accommodate a wide array of cameras and flashes. Simply stretch the elastic opening in the back and the diffuser will work on your external hotshoe flash. If your camera isn't equipped with an external flash, this diffuser also works great with most pop-up flashes. Just slide your camera’s flash through the slit in the bottom to use the diffuser with your DSLR’s onboard flash. When you’re done the ultra-compact design folds flat and easily fits in your pocket for effortless transportation. The ENHANCE Soft Box Flash Diffuser is too good of a deal to pass on. This is professional lighting made easy! Remember to use the coupon code ‘DIFFUSE5’ at checkout from April 14th through the 21st to receive the discounted rate of $9.99 and free shipping. Be sure to check out www.accessorygenie.com to see the Flash Diffuser and other great products!!! If you want to be in the know about great deals, you can sign up for our Weekly Newsletter! That’s where you’ll be the first to know about new products, special discounts, exclusive promotions, and more! Don’t forget to subscribe to us on YouTube, like us on Facebook, and follow us on Twitter for even more great deals!